BROCHURE: MAUI PLANE RIDES: 808-800-6394: Private Maui Air Tours & Discovery Private Maui Flights: All Window Seating: 100% 5 Star Reviews: CLICK, CALL & FLY: Same Maui Sky at up to 1/2 of Maui Helicopter Tour prices with No Strangers: Exciting Discovery Private Maui Flights where You Can Fly the Plane: Maui Air Tours and Romantic Maui Sunset Champagne Flights: Feel Our Maui Aloha! Maui Plane Rides Private Maui Air Tours and Discovery Private Maui Flights offer Stunning, Scenic, Aerial Views. 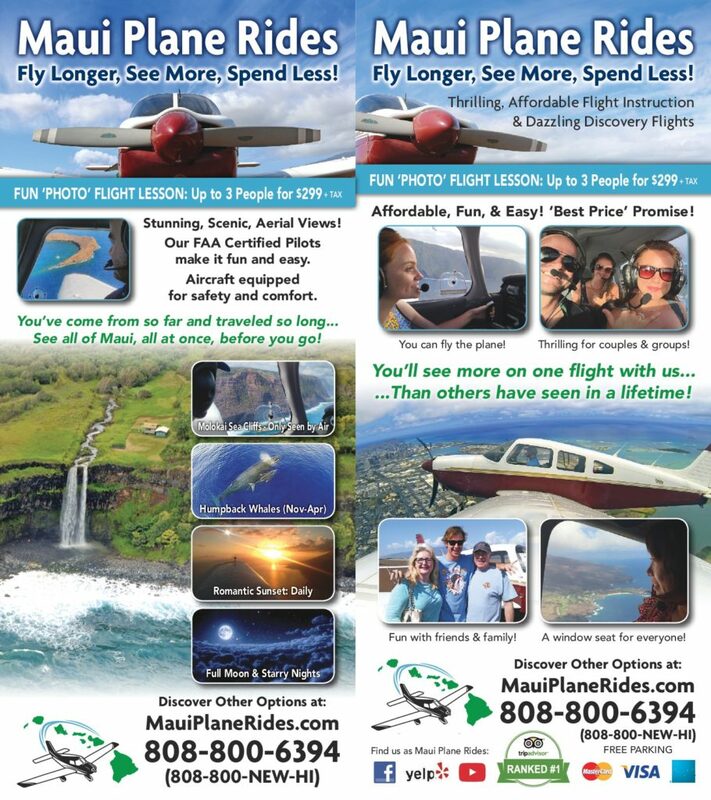 Maui Plane Rides offers 100% 5-Star Reviewed Private Maui Air Tours and Discovery Private Maui Flights: Hands On Excitement as you float above Maui’s Sky! Experience thrilling exhilaration as YOU soar above Maui: Hana Highway, along towering Maui and Molokai Waterfalls and Sea Cliffs, fly by Lanai and Molokai, observe Maui Humpback Whales during a Private Maui Whale Watching Tour flight, or among the Most Romantic things to do on Maui, share a Private Maui Sunset Champagne Tour flight with your loved one. People of all ages can enjoy the once-in-a-lifetime chance to glide like an eagle on our fun and affordable Private Maui Air Tours and Delightful Discovery flights!